Being a new homeowner is exciting. However, it doesn’t come without projects that need to be done! At Lambert Home Inspections, we talk to many new homeowners and are familiar with the things that need to be done upon moving into a new house. Here is a useful list of everything that a homeowner should own to make those DIY projects a reality! Probably the most common tool in any toolbox, it is also one of the most useful! Look for one with a handle that can accommodate interchangeable tips so that a range of screw types and sizes can be handled with ease. You’ll need this tool for putting together many new items that you will be putting in your home. Homeowners find themselves reaching for the tape measure quite often. This indispensable item can help you calculate the square footage of a room for furniture placement, it can help with estimating material quantities, and much more. You’d be lost without this basic yet handy tool! Whether it be for pounding nails, pulling nails, crowbar action, tapping things into place, or anything else, you are going to need a hammer! When it comes time to seal leaks and block moisture, you are going to be glad you have that caulk gun! This tool gives you more leverage than caulk in a tube, making it a must-have for homeowners. This tool can be a lifesaver for homeowners. Without a stud finder to locate a sturdy piece of wood, you subject yourself to huge messes and a lot of frustration. From hanging shelves to installing hardware on cabinets, a power drill can help with just about everything. It is one tool that a homeowner definitely needs. Many homeowners find themselves doing projects such as reattaching cushions, or any job that has to do with fabric or wood. Also known as an Allen wrench, a hex key will come in handy for putting furniture together. They are inexpensive and easy to use. No matter the type of home you move into, you’ll either need to paint entire rooms or at least touch up some spots. Make sure you have a quality set of assorted paint brushes that you can wash and reuse. The need for a paint tray is self-explanatory. Liners will make clean up quick and easy. You’ll need to test the outlets occasionally, so have this tool on hand. Homeowners want to keep the landscaping looking as nice as possible, so a garden pruner is a must! A watering hose is needed for keeping the grass looking great, washing windows, and numerous other projects. For window cleaning, painting, changing light bulbs, and many other things. You never know what you might spill when working on all those household projects! A wet/dry vacuum is essential for homeowners. When you need to apply filler materials, reglaze a window, apply drywall taping compound, or other applications, you’ll be reaching for the putty knife. Water resistant and extremely sticky, this tape is essential for those home projects that we all do! Temporarily fix leaks, or apply it to the bottom of chairs to prevent scuff marks on hardwood floors. The possibilities are endless. 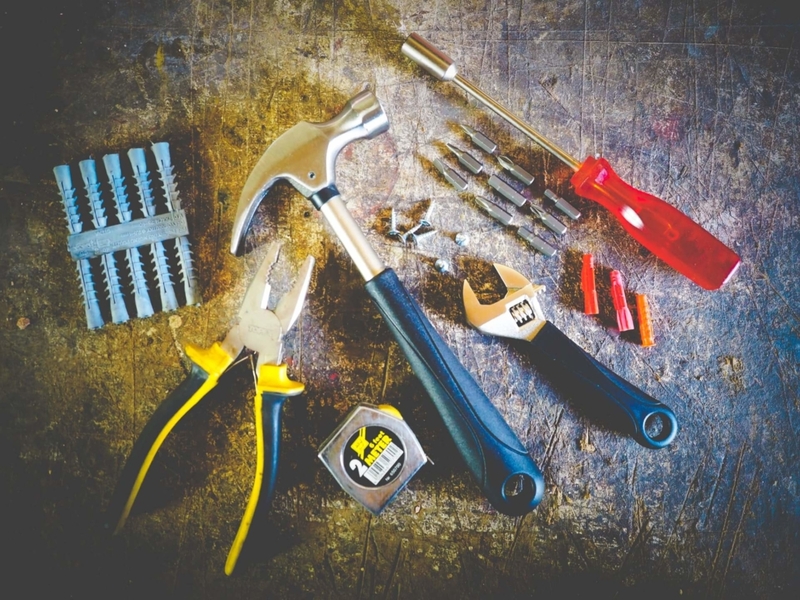 Every homeowner needs a good set of pliers! From replacing old shower heads to slicing wiring, pliers help you get a good grip on all those DIY projects. When you need to open boxes, shave wood, or mark mortises, you’ll want to have a good utility knife with a comfortable rubber-covered handle and built-in blade storage. A basic flashlight is necessary for all homeowners. Surely the day will come when you have work to do inside a dark sink cabinet, or when the breaker trips. You’ll be reaching for the flashlight time and again. All of these necessary tools can be purchased at your local Home Depot. For more information on projects and home inspections, contact us today!